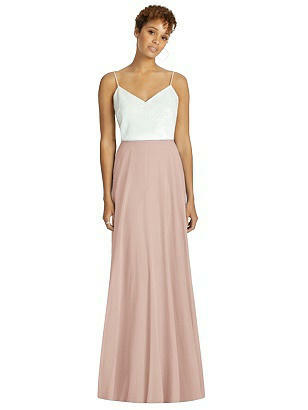 Full length lux chiffon modified circle skirt. Top sold separately. The natural waist measurement takes priority in this style. If you are over by an inch or two on the hip, you should have enough room to release the side seams to allow for that variance. If you would like help choosing your size, please contact a Dessy stylist. Fitting yourself is easy. Just remember that the dress measurements listed below apply to this specific style. Fit Tip: The natural waist measurement takes priority for style S1518. If you are over by an inch or two on the hip, you should have enough room to release the side seams to allow for that variance. If you would like help choosing your size, please contact a Dessy stylist. Measure around your natural waistline. Bend to the side to find the natural crease of your waist, measure at this point. (Approximately 2" above your belly button at the narrowest part of your waist). High Point Measurement provides the length of the dress from its highest point to the hemline. High points differ by style & start at the shoulder, center or bust. The measurements listed in the size chart below apply to this specific style. Please allow for an extra 1/2"-1" for ease of movement when selecting your size. Our dresses are 'made-to-order' according to the dress measurements below, not custom to your individual measurements. Please note that alterations are often required for a 'perfect' fit'. To find your size in a different style, refer to the style measurements on that specific style's details page. Got questions? Ask a Dessy Stylist.